The global threat of a severe influenza pandemic is inevitable, and the world, while informed, is poorly prepared. A century ago, people woke up ill in the morning and fell dead by evening. Considered the deadliest pandemic in human history, global influenza infected a third of humanity, killing no less than 50 million and perhaps as many as 100 million people. 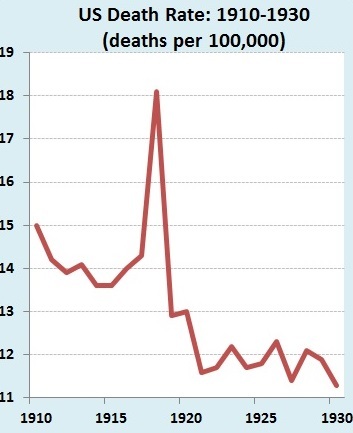 In one twelve-month period, one out of every 100 people on the planet died from the flu. The world has achieved impressive gains in extending human life with the world’s average life expectancy at birth now standing at 72 years, more than double the level a century ago. Nevertheless, another global influenza pandemic is likely, if not inevitable. The pandemic coincided with World War I. The first confirmed outbreak was in March 2018 at Camp Funston, Kansas. After migrating to Spain, it was called the “Spanish flu” largely because the news media in neutral Spain, not subject to wartime censorship, was the first to publicize the epidemic. Also, Spain’s King Alfonso XIII, prime minister and entire cabinet all became ill with the “Spanish flu”. Other European countries had largely suppressed the news to maintain morale. Following the initial outbreak, massive troop deployments in densely packed quarters and numerous civilian travelers facilitated the spread of the virus to every corner of the globe. In India, the pandemic killed as many as 17 million people, or about 5 percent of the population. Another region hit hard was Iran, with no less than 8 percent of the population killed. In Africa, the pandemic is estimated to have killed nearly 2 percent of the continent’s population within six months. The pandemic’s impact was deadly and sudden. In the United States, the demographic outcome was a 30 percent spike in the death rate in 1918, resulting in a drop in life expectancy of about 12 years. In a typical season, the elderly, young children and those with chronic medical conditions generally face the highest risk of serious complications and death. The 1918 pandemic, in contrast, disproportionately impacted healthy young adults, ages 20 to 40. Death rates in 1918-19 from flu and resulting pneumonia were 20 times greater among persons aged 15 to 34 than they had been during prior flu seasons. Mortality peaked at age 28 years. Young adult men in the military, especially those in close quarters in frontline trenches, were hit hard. Up to 40 percent fell ill due to the, and it is estimated that the flu killed more US soldiers and sailors than enemy weapons during World War I. A year after its initial outbreak, the global pandemic had killed more than double the 10 million who had died in World War I. At the start of the 20th century, a leading cause of death in many countries, including more developed ones, was influenza/pneumonia. Influenza/pneumonia was the top killer in 1900 for the United States, accounting for 12 percent of all deaths. By the beginning of the 21st century, deaths due to influenza and pneumonia had declined substantially. In 2015 the top 10 causes of death worldwide did not include influenza/pneumonia. Still, seasonal influenza sickens millions, and this year appears to be worse than usual. For many healthy young adults, a bad case of the flu is their first intimation of mortality. Each year influenza kills hundreds of thousands of people globally. Recent estimates suggest roughly between 300,000 to 650,000 people die from seasonal influenza-related illnesses annually, higher than previous estimates of up to 500,000. Many countries including Australia, China, India, the United States and United Kingdom report that this year’s outbreak is the worst in years. Antibiotics only became available after the Second World War. Considerable improvements have also been made in sanitation, nutrition, hygiene, housing and worldwide supply of influenza vaccines. However, vaccines may have limited effectiveness depending on the influenza strains which constantly change, mutate and evolve. Consequently, another pandemic similar to the one a century ago remains a serious global public health threat. Since the 1918 influenza pandemic, world population has more than quadrupled to 7.6 billion. The world population shifted from being largely rural to predominately urban, with many millions living in close quarters. People are more mobile with modern air travel. An estimated 258 million migrants live abroad, and no less than a billion border crossings occur annually. Such demographics combined with strained health services in some nations and close human proximity to domestic animals, particularly poultry, in others facilitate the rapid spread of influenza. Estimates suggest that seasonal influenza epidemics can affect up to 15 percent of the population with enormous economic consequences. Estimated costs of a US influenza pandemic, for example, would be more than $100 billion. Vaccinating 60 percent of the US population would substantially reduce the costs and the number of deaths. Such a high vaccination rate may be difficult to achieve within the time period required for vaccine effectiveness. Another challenge: opposition to vaccinations by some groups and individuals. Health recommendations widely promoted are too often not followed. The most effective way to prevent the disease’s spread is comprehensive influenza vaccination programs across countries, and the World Health Organization urges people, especially those in high-risk groups such as the elderly, to get a yearly vaccine. Other precautions include regular hand washing and cough etiquette. The healthy should avoid people who are sick, and the ill should stay at home – resting and drinking plenty of fluids are advised until at least 24 hours after fever is gone, consulting a physician for complications. In 2003 the World Health Assembly adopted a resolution urging countries to increase influenza vaccination coverage of all people at high risk and to attain 75 percent coverage among the elderly by 2010. Available data for 2015 on seasonal influenza vaccination rates for the elderly show wide variation among countries. 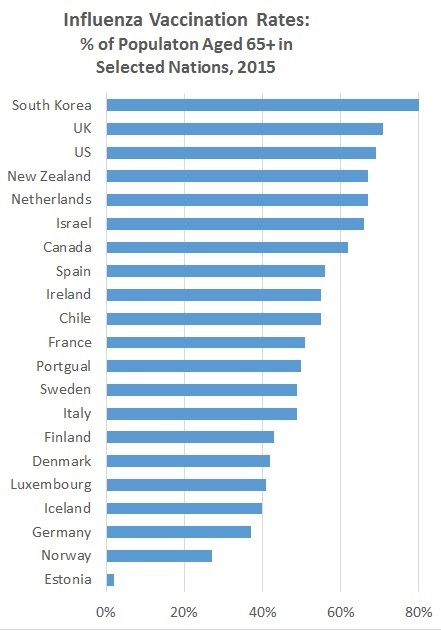 Among 26 OECD countries, for example, none achieved the recommended vaccination rate of 75 percent for elderly except South Korea at 82 percent. Only five countries, the United Kingdom, the United States, New Zealand, the Netherlands and Israel, had vaccinated at least two-thirds of their elderly populations. Research suggests another influenza pandemic is inevitable, remaining a global threat, and the world is poorly prepared, even wealthy advanced economies. US hospitals, for example, lack adequate medical supplies for a serious flu epidemic and have contended with funding cuts in public health budgets over the past 15 years. Despite repeated recommendations from military, national security, biodefense and public health experts, political leaders fail to increase funding to prepare for an influenza pandemic. Consequences of an influenza pandemic are expected to be more severe in developing countries than developed countries. More people in wealthier countries are likely to have access to influenza vaccines and can afford antiviral drugs while poorer countries do not. In short, the wealthy countries will be too busy dealing with the pandemic among their own populations to address the needs of the poor nations. Public health specialists have already identified the only solution to avoiding a devastating global influenza pandemic – a universal flu vaccine that protects people against essentially all or most strains of flu, with protection lasting for years or perhaps even a lifetime. Such a vaccine is likely in the near future, based on recent medical advances. For years, researchers have sought a “super-shot” that could replace the annual vaccination and protect the world’s population against most influenza strains – a herculean task against a virus that constantly evolves. Despite the formidable challenges, a universal flu vaccine is humanity’s only way to avoid a global influenza pandemic. Until then, robust immunization programs in all countries are urged. *Joseph Chamie is an independent consulting demographer and a former director of the United Nations Population Division.